The wall ball challenge is offered as an incentive for boys to practice on their own. This can be accomplished either at home with a lacrosse bounce back; at the lacrosse wall next to the high school; or during free gym sessions this winter. Boys should always practice with their gloves. (helmet optional at parents discretion). They will be required to wear their gloves in the video’s submitted for the challenge. The Wall Ball challenge is being offered to boys in grades 2nd through 8th. For 2019 we are offering two reward levels. Rewards will be offered to boys able to complete the challenge and consist of free helmet stickers. The Standard “M” logo will be offered to those able to complete Level 1 for their respective grade level. 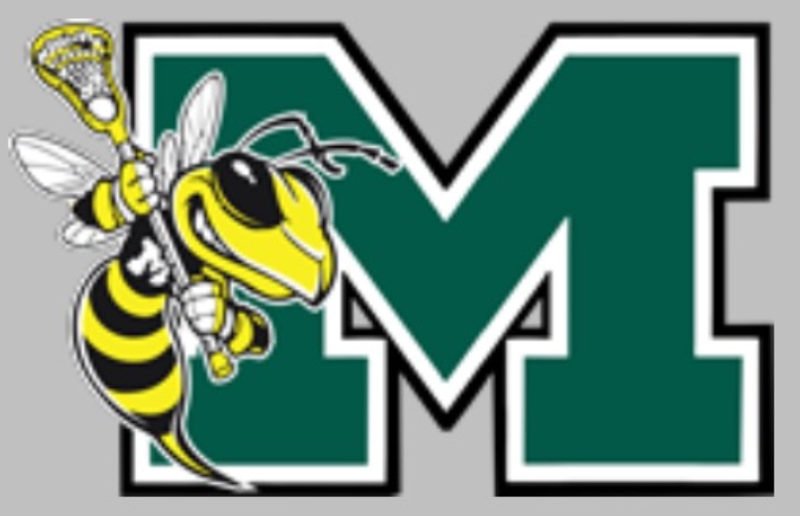 The Hornet “M” logo will be offered to those able to complete Level 2. ONLY one set of helmet stickers will be provided free of charge this year. While video submissions can made beginning in January 2019 to my email (Hogencamp11@GMAIL.com), we will not be placing orders for stickers until March 16th, 2019. If your son is able to pass level 1, we suggest holding onto that specific video and have them work towards passing level 2. This particular challenge will consist of 5 different drills, all of which should be done from 6-7 feet distance from the Wall(or bounce back). The levels (1 & 2) differ only on the number of repetitions (catches) required for each drill in a 1-minute timeframe. Dropped passes are allowed, however drops must be limited to meet the repetition requirements. It is strongly recommended to have a few extra balls close by when shooting the video submission. PLEASE, do not submit the video unless all drill requirements have been met accordingly. For the two-handed challenge, make sure they are perpendicular to the wall when throwing/catching. NOT facing the wall directly, as this will result in passes coming back on the wrong side of their body. (The below video will offer proper technique here.) The top hand should be up next to their ear, with their bottom hand pointing to where they wish the pass to go. (Pull with the bottom, push with the top). Please ensure a half cradle is being made in between throws (no quick sticks). Only repetitions with a half-cradle will be counted as a full repetition. WHY do we need a Half-Cradle? – The Half cradle ensures that the ball is in the proper position prior to make a pass and/or taking a shot. This ensures the ball will come out consistently and on-target, helping to eliminate “pop-flies” and errant passes in the future. Make sure passes have enough velocity on them to come back at their head level, which will ensure the kids are catching the ball properly. Weaker passes will result in “basket” catches, resulting in additional (unnecessary) time taken between reps. Catches should be made with the stick in the vertical position for boys to attain the maximum amount of repetitions. One handed passes will prove challenging initially, especially for younger players. Have them hold their hand closer to the top of the stick. They should be “snapping” their wrists as they throw the ball, pointing the stick at the intended target. The more wrist strength a child has will allow them to move their hand more towards the middle of the stick. Please ensure a half cradle is being made in between throws (no quick sticks). The ability to understand these concepts will prove extremely beneficial to all the boys. Each of these drills will be practiced at the beginning of each indoor gym session this winter. We have set repetitions for each level for each grade level accordingly. NO, we are not a club program, however this challenge should afford parents and kids the ability to practice on their own, and offer incentive to those willing to put in additional time outside of our normal practice ours. Only with practice (and practicing with the proper technique) will the boys become better players. REMINDER: Parents should submit a video of all 5 drills, ONLY, if their son has passed.